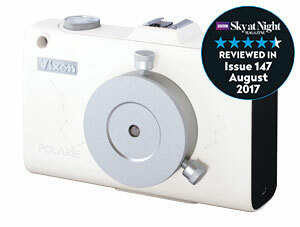 The Vixen Polarie is a specialist photographic accessory that allows you to take pin-sharp photos of stars and constellations. It is designed to follow the apparent motion of the stars caused by the earth’s rotation, eliminating star trails. Using the Polarie to take wide field images of constellations, shooting stars as well the Milky Way is surprisingly straightforward. Polarie also enables you to photograph “starscapes” by adding a darkened landscape or silhouetted figure in the foreground of your frame. The Polarie can be set up in a few minutes even by those not familiar with the exact position of the celestial pole. Simply turn the Polarie in the direction of the pole star using the supplied compass as a guide, then use the built-in latitude meter and polar sight hole to align the mount. The Polarie is designed to work with camera lenses that take wide-angle images. The Polarie can operate for more than 2 hours on two AA-size batteries. It’s compact size and minimal weight means you can take the Polarie anywhere to photograph the night sky. If you already own a Vixen Polarie Star Tracker, the upgrade kits are a great way to get more from your mount. Both kits include all components required to increase the maximum payload of the Polarie from 2kg to 6.5kg. A heavy-duty mounting block with Vixen-style dovetail attachment and quick release lever makes mounting and pointing larger accessories quick and simple. The mounting block has a clear central aperture that allows the polar alignment scope to be left in place after alignment. The Dovetail Slide Bar DD enables you to quickly and easily mount and balance a DSLR with large telephoto lens using the counterweight bar. Alternatively, a second camera can be attached. Click to link to video set-up and user guides for the Polarie Star Tracker, or click on the logo to visit Vixen's YouTube channel. The Vixen Polarie Polar Scope PF-L 5x20 uses a simple three star alignment process which eliminates the need to use setting circles. There is a smart phone app to assist with set up available for Android and iOS phones. Custom cradle to hold the Polarie Star Tracker on the Mini Porta or Porta II Mount. Attaches between rear of Polarie and tripod screw to enable horizontal tracking for time lapse photography. 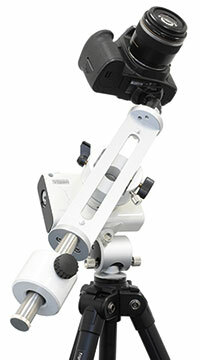 The Polar Fine Adjustment Unit sits between a photographic tripod and a star tracking mount such as the Polarie. It allows fine adjustment in both horizontal (azimuth) and vertical (altitude) axes to aid polar alignment when using a polar axis scope. Replaces the original mounting block supplied with the Polarie. Increases payload capacity to approx. 6.5kg and allows polar scope to be installed during tracking. For use with 75525 Dovetail Mounting Block to mount heavier camera equipment such as full-format DSLR with telephoto lens. Can be used with Supplementary Counterweight Bar (75826) and Counterweight (75801). For use with Quick Release Panorama Clamp 75527. Allows for easy framing in both vertical and horizontal directions. Long section can be used independently to mount a camera or OTA with 1/4" screw thread on a Vixen-style dovetail clamp. Rotating clamp unit for Vixen-style dovetail attachments. Uses a quick release mechanism to allow easy adjustment. Can be used with 75526 Quick Release Angle Plate.